Now that the first successful Regulation A+ company is trading on the Over-The-Counter QX and more are in process, we can look back at everything we have learned. This new Regulation A+ (“Reg A+”), Title IV of the JOBS Act (SEC Reg A+ Press Release) has been validated and proven to work as designed. When considering Reg A+ as an option for your growth capital, you should hire an experienced financial and well-rounded business team. They should have the expertise you will need to strategically guide you through Reg A+ efficiently, smoothly, and within Reg A+ legal guidelines to prevent any FINRA or SEC issues that delay or stop your Reg A+ offering. If an investor expresses interested in an investment, they sign up and indicate their interest in this Testing the Waters phase. If it takes weeks to contact that interested investor, you lose a big percentage of those investors who may no longer be interested or have the funds available. 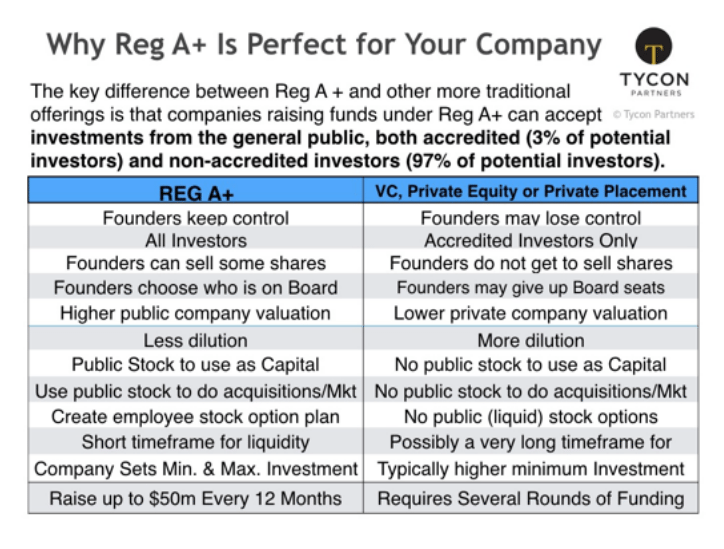 Reg A+ allows a company to raise growth capital from the general public that includes non-accredited investors. It has been estimated that non-accredited investors make up approximately 97% of the potential investor population especially because the regulatory standards have increased to qualify as an “accredited investor”. There are about 150 companies in the Reg A+ offering process and much has been learned. The first lesson is a fundamental one, time kills all deals! The first company utilized the “Testing the Waters” (pre-offering) provision of Reg A+. The second lesson: Your back office should be seamless and transparent to the investor. This includes the acceptance of the investor funds, FINRA clearing firm, regulatory & compliance, transfer agent, Broker Dealer (to deposit the stock), and the ability to trade your shares. To clarify, when you allow a minimum investment of $600 from investors, who are typically “non-accredited,” the process must be seamless and transparent. Here’s an example of what you don’t want to happen: In one of the first Reg A+ offerings, the investors received an email informing them that their shares were available and awaiting instructions to transfer these electronic shares. If the investor called, the investors were informed that there are two Broker Dealers that would accept this company’s electronic shares, the first wanted a fee of $500 to accept these shares and the second wanted $1,000. The non-accredited investor who invested $600 is now being told to pay (invest) another $500 to get liquidity in a $600 investment. 1. Will the additional $500 plus the $600 investment be more than 10% of that investors net worth? Remember, the investor must attest that the total investment is not over 10% of their net worth in a Reg A+ offering or they are disqualified to invest. 2. If the investor can pay the $500 fee to allow their stock to trade, will there be liquidity in the public market for that stock? Or did they just pay another $500 (for a total of $1,100) and now have an illiquid investment because there is low trading volume and a large spread between the bid and ask price of the stock? 3. If they invested $600 at $12 per share for 50 shares and now their cost basis is $22 per share and the stock is trading at $22-$24 per share on low trading volume, there is no real liquidity. If they could sell their shares, they may get their money back (minus cost of trade) or even make a couple of dollars, if they’re lucky. The third lesson: non-accredited investors should not be taken advantage of with Reg A+ offerings with companies that have unrealistic valuations and do not sell enough shares to make a real market in their public stock. The first Reg A+ offering was valued at over $300 million and they sold about 7% of the stock in the offering. 7% of the stock in the public float is not enough to make a real public market in the stock when it trades sporadically on little volume, large spread between bid & ask and will trade like a “promoted” penny stock. When you analyze the company’s financials you learn that they are over $500 million in debt and need over $200 million additional funds to produce the product they sell, but sold shares to the investors at a very high valuation. It’s important to have a corporate finance strategy that results in real liquidity for your stock. 1. The first offering’s average investment was $2,600 from 6,400 investors. the funds as they come in. 4. There is no quiet period for a Reg A+ offering. A recent Reg A+ offering raised $2.5 million with 500 investors in the first 24 hours after the SEC qualified the offering. This proves that Reg A+ does work if marketed correctly. What has been learned about Reg A+ offerings is that they are a viable and effective funding tool for companies and real estate projects. But, it is important to have a plan that includes a company description that has appeal to the general public, has realistic valuations and will have a plan for real liquidity of the stock trading in the public markets. 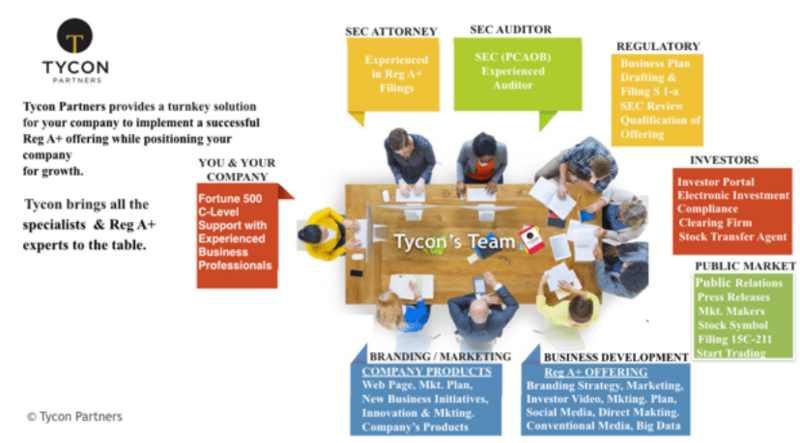 Consider hiring a specialist, like Tycon Partners who can guide you through the process. This should make your Reg A+ offering produce a successful offering and a real public company stock that trades with volume, a tight spread between the bid and asking price and offers investors true liquidity. 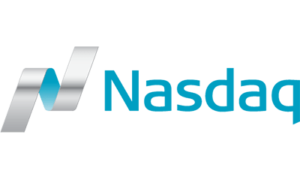 Reg A+ can provide the funds to achieve a company’s success in their respective businesses and be a pathway to an up-listing to the NYSE or NASDAQ public markets once the company qualifies. Tycon provides a strategy for your pathway to success.